On this trip we will learn the landscapes, culture and people of Ladakh. Our 9 days trek starts at Hinju. We drive along the Indus River to make visits of Alchi – one of the few remaining monasteries from the 11th century. Continue drive to Lamayuru through a lunar landscape. Finally arriving at Hinju where our actual trek starts. Further crossing of small pass, meadows, through tiny and beautiful villages. Than climb to the 4950m pass of Kongski La and further down to River valley with next crossing of Dundunchan La to Chilling. Along the Zanskar River to Choksti (3210m). We climb very steeply out of Choksti. Crossing the Palam peak (5380m) descent to Ganda La (4800m) in to Rumbak valley and across Stok La to Stok. Where our trip ends. 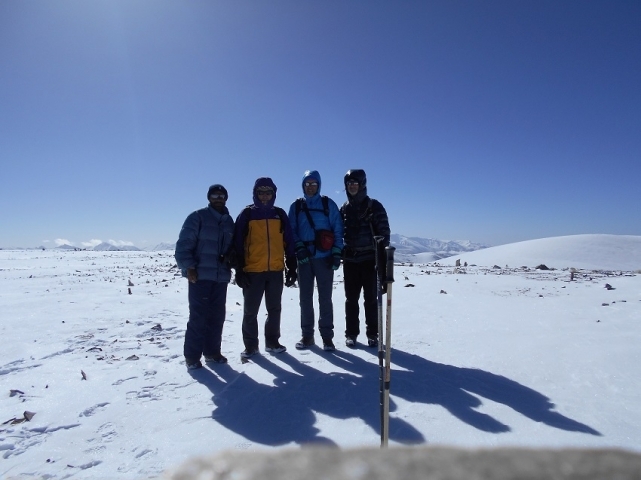 Day 1 - Drive Alchi – Lamayuru (3,364 m)- Wanla (3,090 m) - Hinju (3,738 m), 5-6 hrs. Day 2 - Trek Hinju – Kongski La (4,950 m) – Sumda Chenmo Dok (4,100 m), 6-7 hrs. Day 3 - Trek Sumda – Lanak (4,300 m) / Base, 5-6 hrs. Day 4 - Trek Lanak – Dundunchan La (4,800 m) – Chilling (3,180 m), 6-7 hrs. Day 5 - Drive Choksti (3,210 m), 1 hr, Trek to Choksti dok (3,210 m), 5-6 hrs. 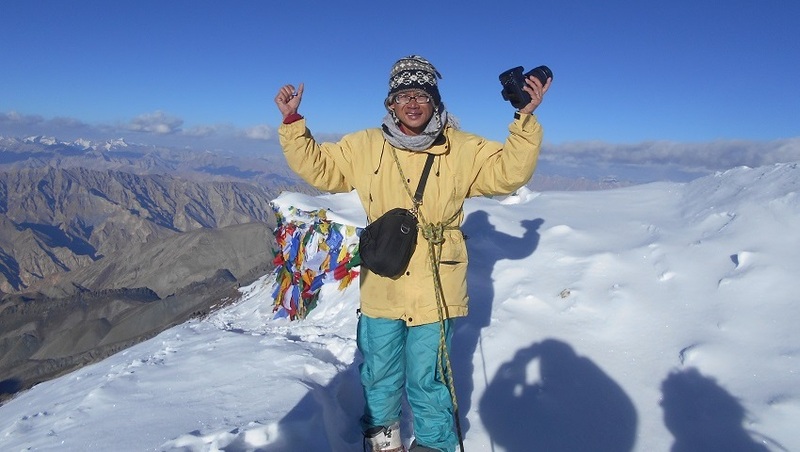 Day 6 - Trek Choksti dok– base of Palam (5,030 m), 4-5 hrs. Climb to Skyang peak. Day 7 - Trek base of Palam – Palam peak (5,360 m) –Ganda La (4,800 m) - Ganda La base (4,400 m), 6-7 hrs. 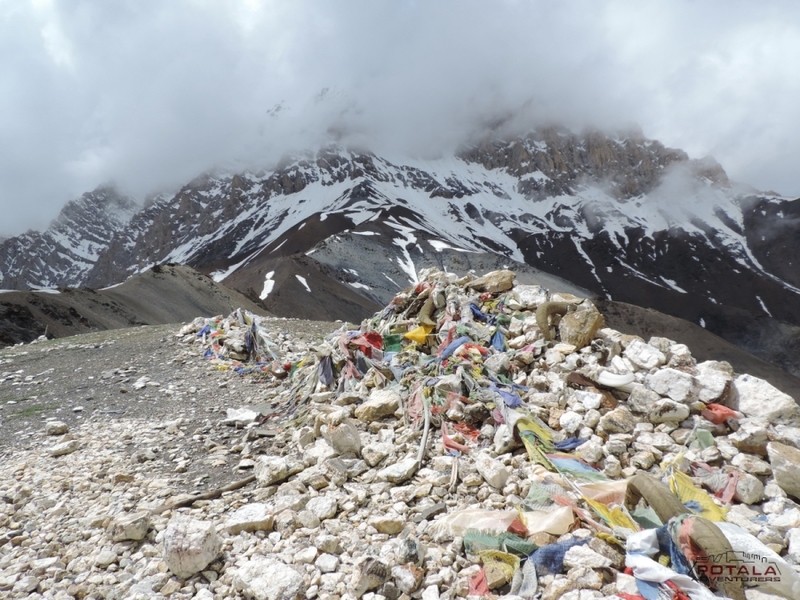 Day 8 - Trek Ganda la base – Rumbak (4,050 m) – Base Stok La, 6-7 hrs. 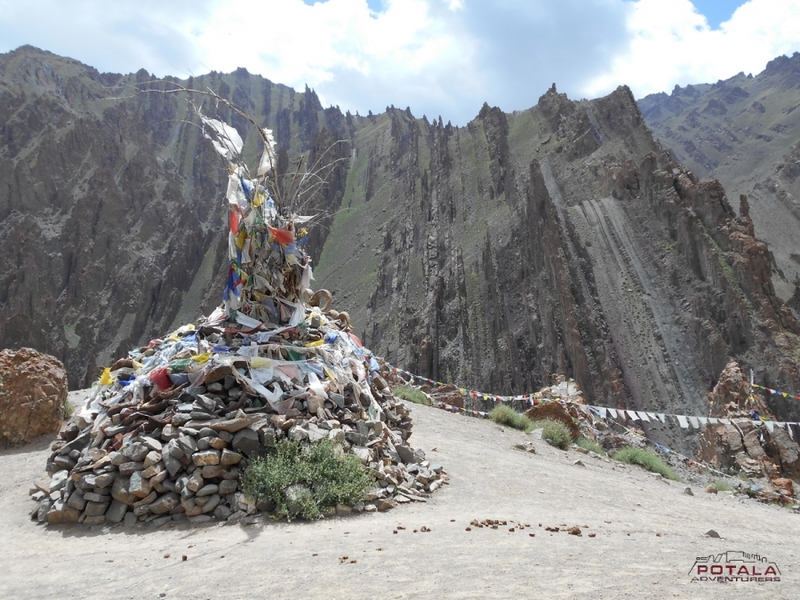 Day 9 - Trek base - Stok La (4,900 m) – Stok, 7-8 hrs, Drive Leh. Day 1 Drive to Alchi – Lamayuru (3,364 m)- Wanla (3090m) - Hinju (3,738 m), 5-6 hrs. Today you drive Leh – Srinagar highway, along the Indus River to Lamayuru which is 126kms from Leh. 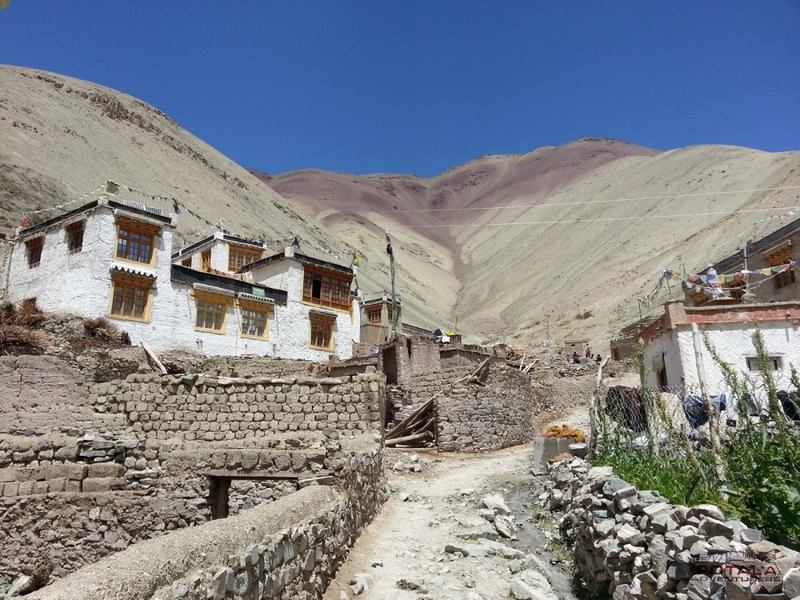 Enroute visit to Alchi village which is one of the oldest remaining monastery of 11th century. Arrive Lamayuru and visit the monastery. 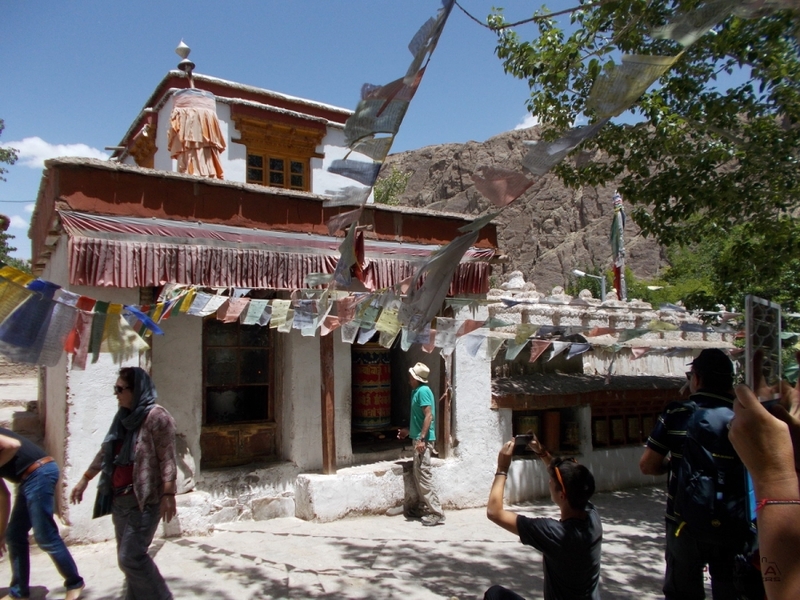 This monastery was constructed by Arahat Nimagung in between 10th and 11th century. History says that in the 11th century, the Mahasidha Naropa visited this place and the cave where he resided and meditated is still to be seen inside the monastery. After the visit, drive back till small monastery on the bank of Yapola River. Leaving behind highway, you enter in awesome Yapola valley. Continue drive along the road as far as wanla – Phanji La where you take left valley upto last portion of road. Hinju is not far from here. 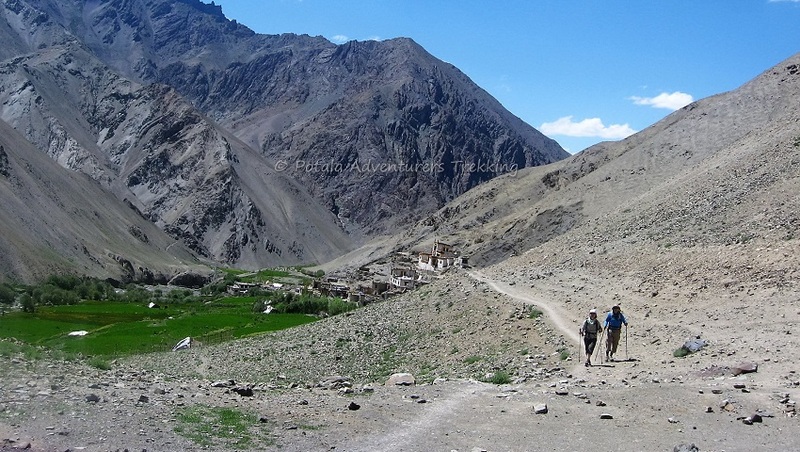 We walk for about an hour along the Ripchar valley to reach the small campsite near the river. Overnight camp at Hinju. Day 2 Trek Hinju – Kongski La (4,950 m) – Sumda Chenmo Dok (4,100 m), 6-7 hrs. From camp you go along with the river. At the end of the river, you pass through the nomadic summer camp of village of Hinju and then steep ascent to the Kongski la. While enjoying the landscape of the surrounding wonderful mountains and valley, gently ascend to the pass. From the top, you enjoy awe inspiring view of landscape of the enchanting valley far flung view next day's passes to cross. Easy and gentle descent down in the valley and continue down as far as Sumda chenmo dok. Possible to see troupe of Yaks. Overnight camp near the small River. Day 3 Trek Sumda – Lanak (4,300 m) / Base, 5-6 hrs. After breakfast, start the trek along with the riverside and gorges. On the way, you pass across a beautiful and charming village with few houses known as Sumda chenmo. Visit local house and take some refreshment after then continue trek on right-side down in the splendid valley as far as River. Cross the small river, then gradually climb up to the steep pass. Enjoy the view of superb and spectacular mountains and valley from the top. Cross the pass, you keep on easy and gentle trek as far as Dundunchen base with awe inspiring view. You may be able to see domestic and wild animals around here. Overnight camp at Lanak. 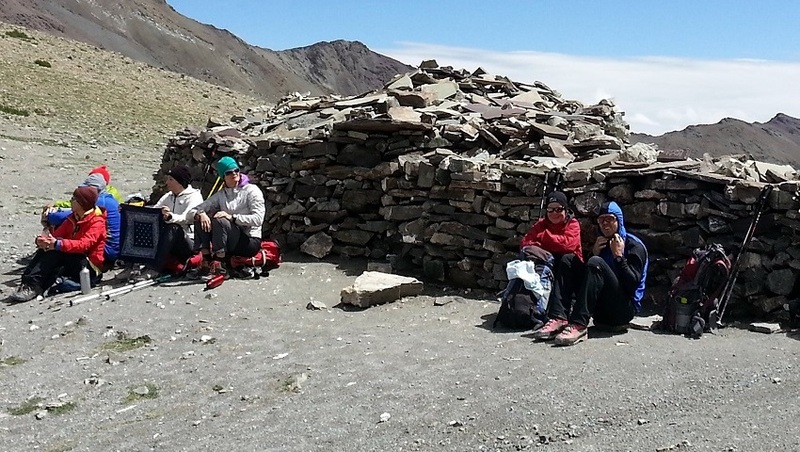 Day 4 Trek Lanak – Dundunchan La (4,800 m) – Chilling (3,180 m), 6-7 hrs. Morning after breakfast, right from the camp gradually ascend up towards the Dundunchan pass. 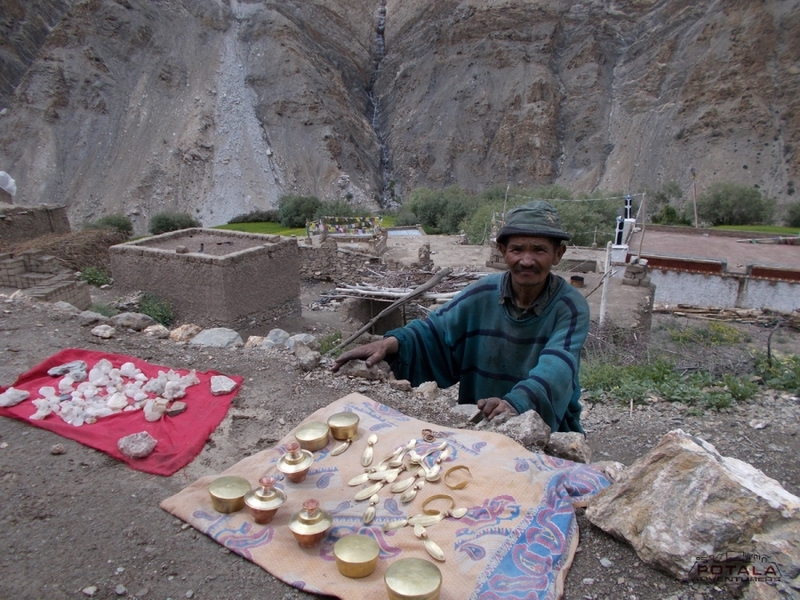 You pass across Shepherds, displaying their handmade skills and things and asking you to buy their products, of Chilling village while climbing the pass. From the pass, you everlasting lost landscape of surrounding valleys and snow clad peak of huge towering stunning mountains. Enjoy the unforgettable scenery of Awe inspiring view of massif peak of Kang yatse (6400m) and Stok Kangri (6153m).Easy steep descend, with imposing view of surrounding spectacular valleys and Zanskar River, as far as riverbed to cross the river 2 to 3 times up to Chilling. Late afternoon, explore village, its famous craftsmen and visit monastery and local house. Overnight camp at Chilling. Day 5 Drive to Choksti (3,210 m), 1 hr, Trek to Choksti dok (3,210 m), 5-6 hrs. Leave camp after breakfast for Choksti. 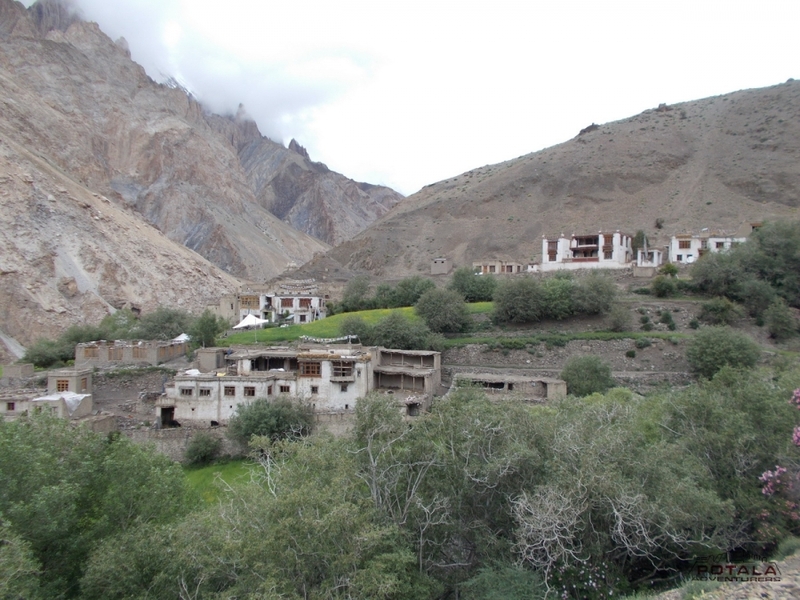 We drive through stunning and exquisite gorges along left bank of downstream Zanskar. Cross motor bridge then turn right and take villager trail that leads to Choksti village. Continue easy ascend few minutes towards the beautiful small village Choksti (few houses). Explore the culture of village by visiting local house. Enjoy the scenic beauty of the valley and surrounding huge spectacular mountains. 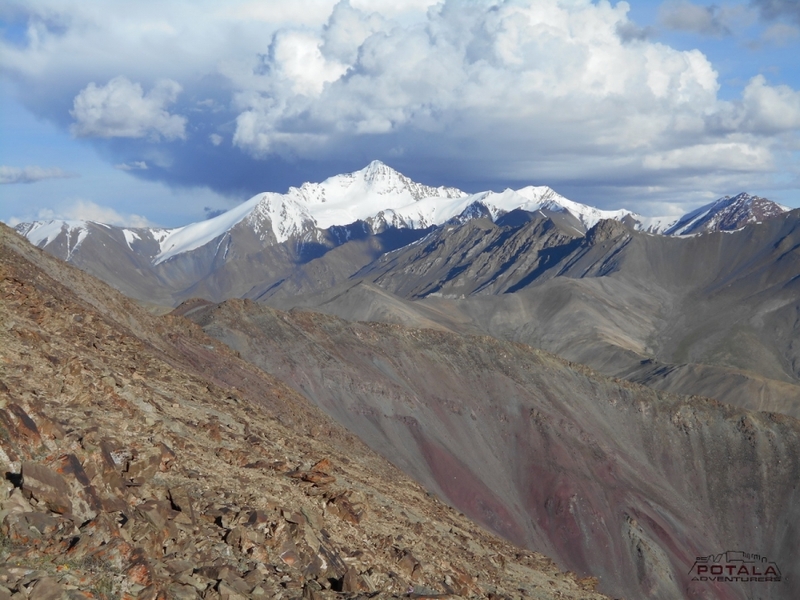 From Choksti it goes slowly but consistently upward in the Stok Range Mountains. 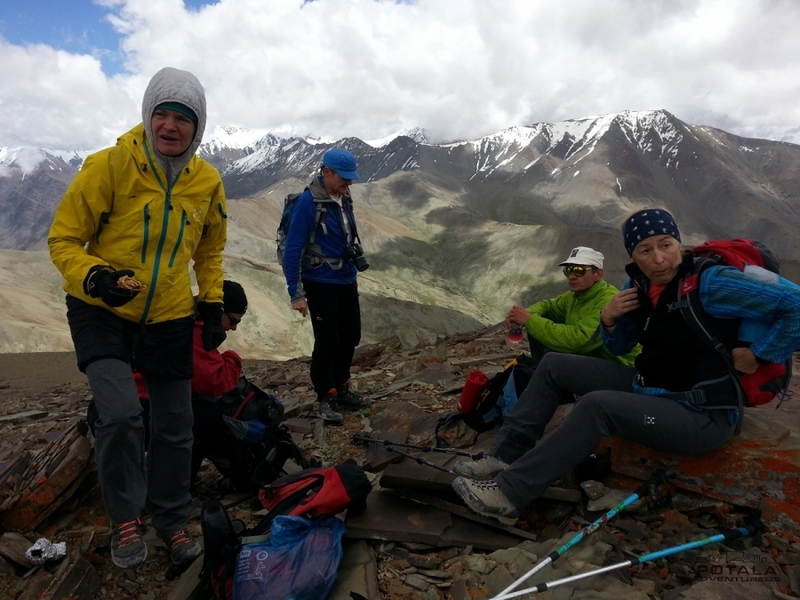 A fairly hard first days walking as we climb very steeply out of Choksi. As we ascend the valley narrows and becomes more and more spectacular. Looking back we can see the magnificent rock formations of the Ladakh Mountains. The dramatic mountains in various shades of purples, greens and browns can be seen for miles in every direction. The last trees and shrubs remain, barren, wild high mountain scenery surrounds you, and only along the watercourses thrives vibrant green. With a little luck you can watch the first mountain goats, marmots and Blue Sheep’s today. The tents are on a beautiful green square in the Choktsi dok. Anyone who wants can still take a trip to a lookout point with around 4480 m altitude after tea. Overnight camp at Choksti Dok. Day 6 Trek Choksti dok - base of Palam (5,030 m), 4-5 hrs. Climb to Skyang peak. A short stage leads through fascinating landscapes with colorful rock formations that are so typical of Ladakh. Up to just below the Kang La base (4900), again with extensive views of the five peaks of the Ladakh-group in the north, beyond the Indus Valley. We are not alone up here: marmots, blue sheep, mountain goats and Dzos (crossing yak / cow) keep us company. 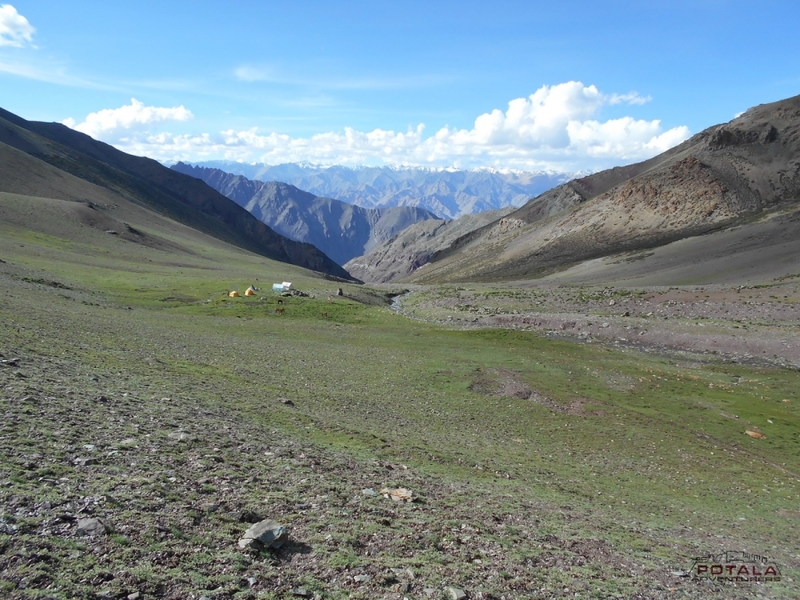 In the vast alpine meadows to find edelweiss, are our tents in the middle ... After lunch is still a trip to a 5056 m high ridge possible, which offers a view from Indus valley with Leh to Stok Kangri. 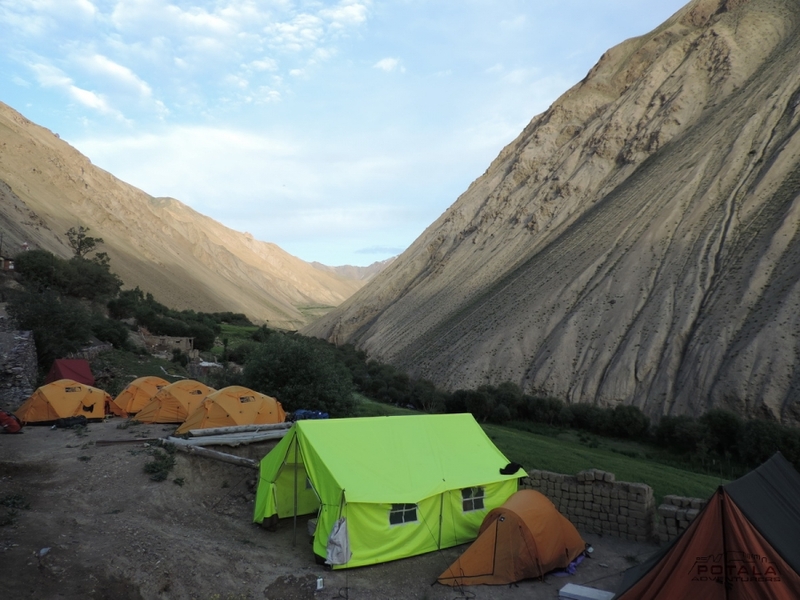 This is one of the most spectacular wild camps with great views across to the Karakoram. Day 7 Trek base of Palam - Palam peak (5,360 m) –Ganda La (4,800 m) - Ganda La base (4,400 m), 6-7 hrs. Today is a hard day as we cross our first pass. The climb is a long ascent, which is gradual at first with a last steep rocky section to the top of the Kang La (5,260m). The paths are little used and can be indistinct. 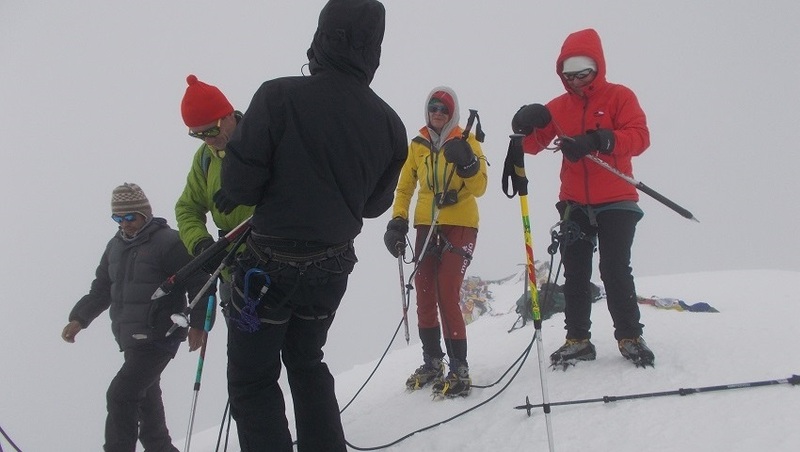 From the top of the pass we have the opportunity to walk up Palam Peak (5,380m) for views second only to the view from the summit of Stok Kangri. Ahead we can now see the summit of Stok Kangri and in the distance is Leh. Behind us the Ladakh Range and Himalaya can be seen for miles. From the top we descend a little and then contour round into the next valley. 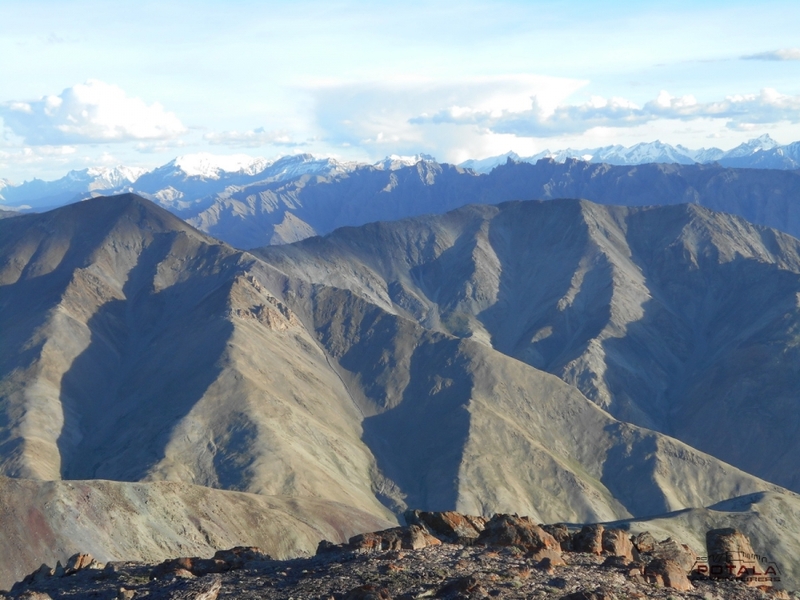 As the trail contours round the top of the valley we have great views across to Stok Kangri. Descending a short way we have another magnificent wild high camp at 4,900m for acclimatisation with views across to Stok Kangri. We contour round the valley and on up to our second pass, the Ganda La (4,800m). 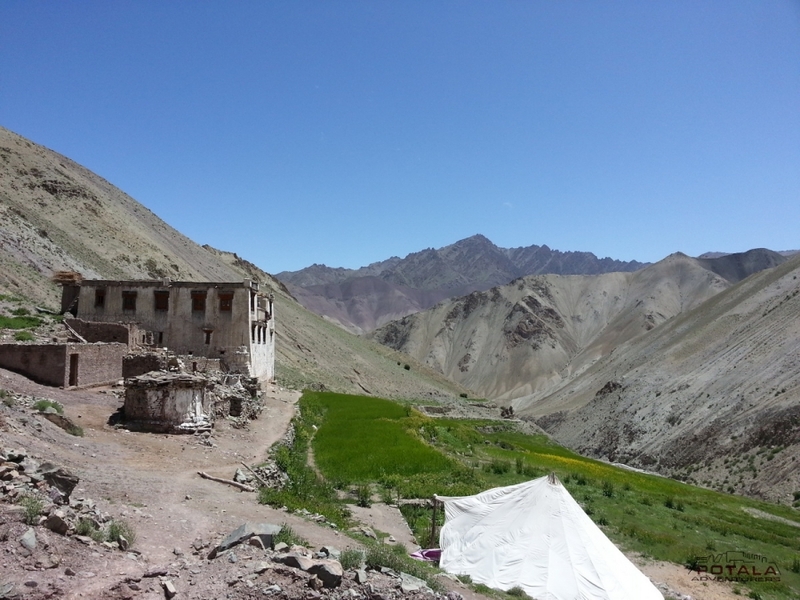 This pass provides access into the Markha Valley. From the base we descend into a beautiful valley and met the picturesque hamlet Yurutse, 4150 m, in the midst of a green oasis is located. 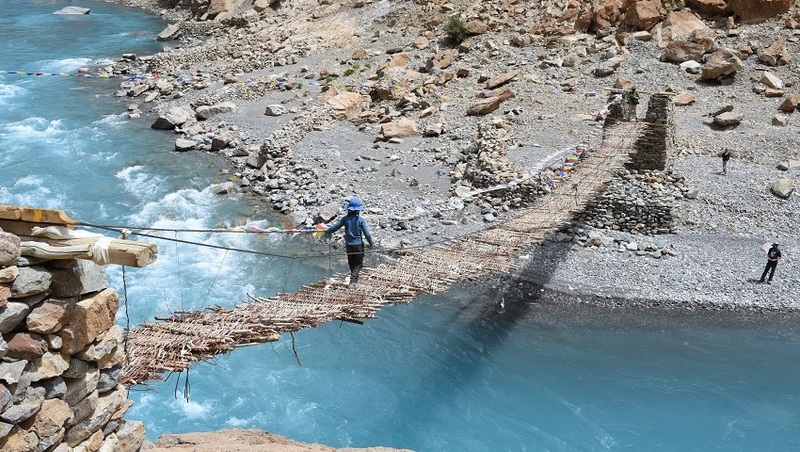 Further down we cross the river on a wooden bridge and go to the idyllic village Rumbak, 4000 m, turn a green oasis in the majestic Stok Mountains. 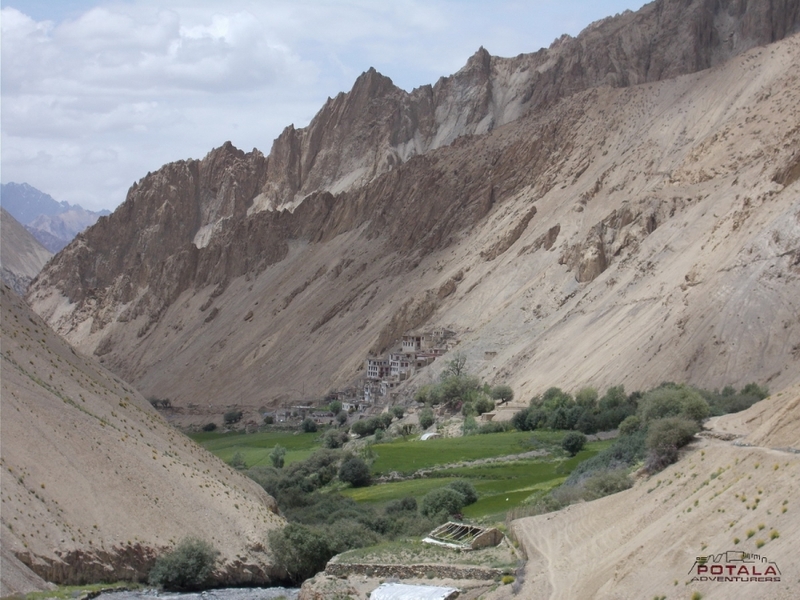 You can explore the village and Gompa. Especially impressive is the way of life adapted to the nature of the Ladakhis, who live mainly by agriculture throughout the year. 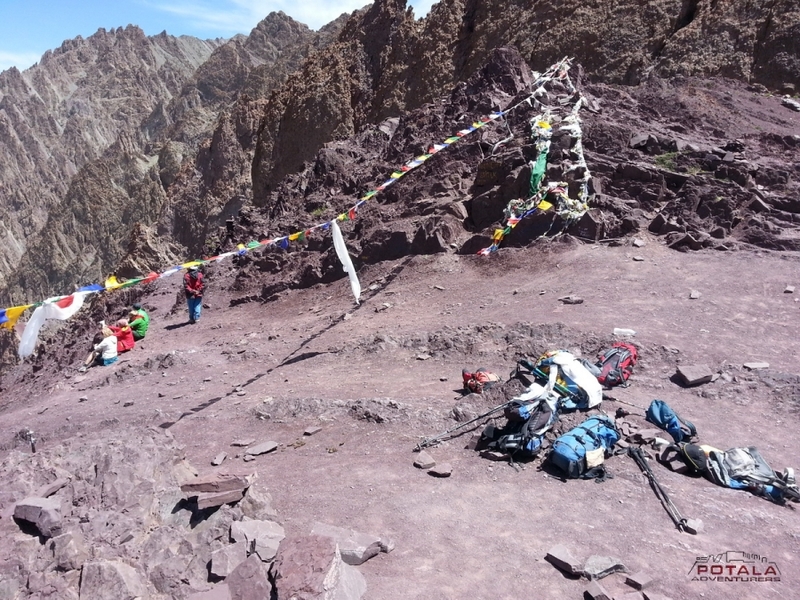 The way on leads out from Rumbak the next camp, with a small stream and overlooking the Stok La pass. 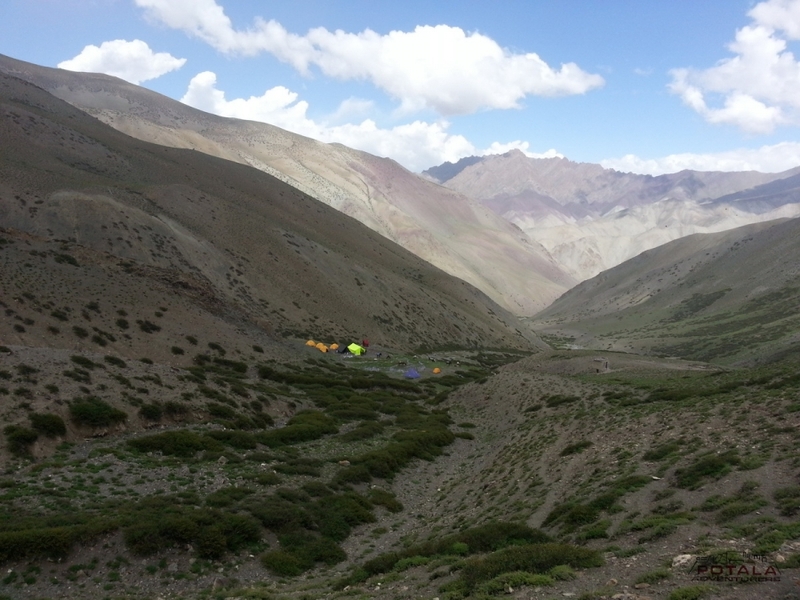 Day 9 Trek base - Stok La (4,900 m) to Stok, 7-8 hrs, Drive to Leh. Leaving camp we cross the Stok La (4,900m), our last pass of the trek. At first we trek on a beautiful, gently sloping trail, but then the path becomes steeper and steeper as it zigzags up to the top of the pass. Rock flutes rise all around us, home to the elusive snow leopard. From the top the views are even more spectacular; layer upon layer of multicolored rock cathedrals are spread before us in every direction. 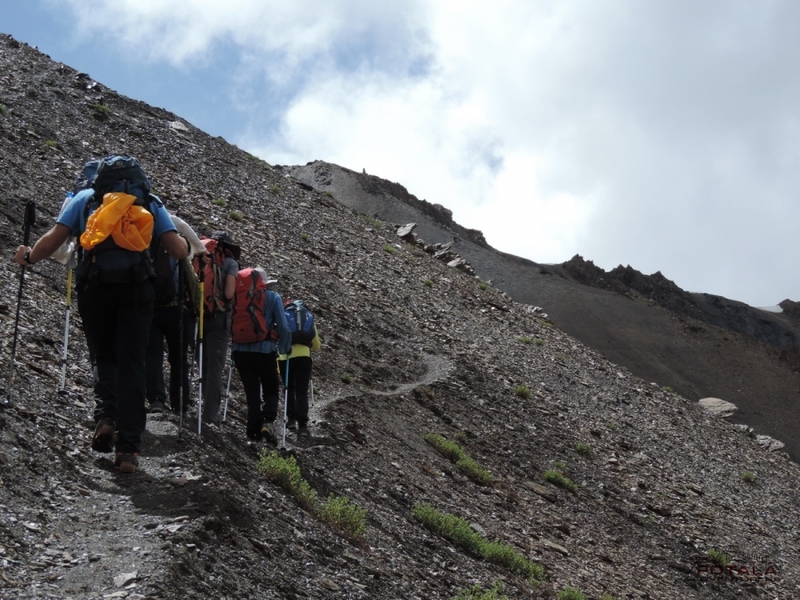 The descent is very steep at first and then we contour round two valleys to the junction with the river coming down from Stok Kangri. Follow the left bank of this river as far as the village Stok. Here you can visit the Stok Palace. It was the home of the king of Ladakh. The museum has a unique display of rare ornaments from the royal family, plus thangkas, traditional clothing and jeweler. At Stok visit of Royal Palace built during 1825 AD and palace has great collections of antiquity. Continue to visit Matho situated 10 km from Stok, which has 10th century complex. 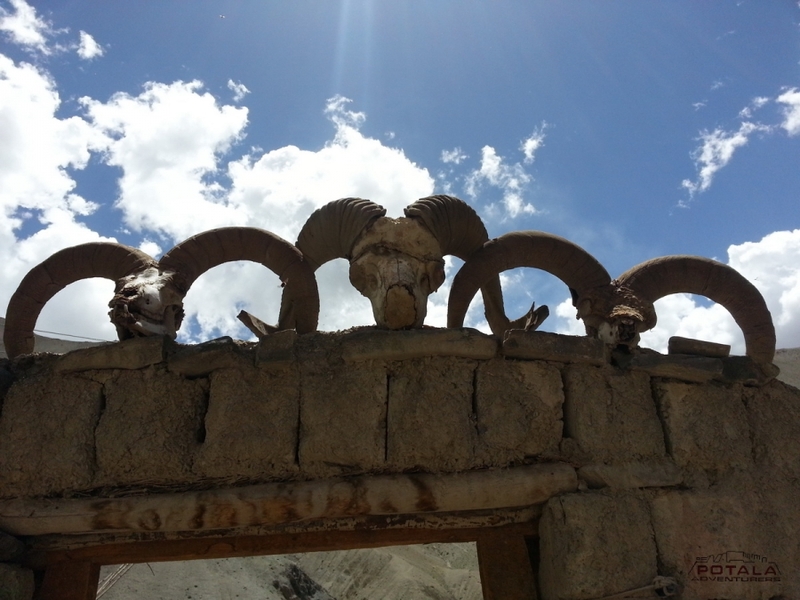 We drive to Leh which is situated opposite of Stok at a distance of 14 kms, crossing bridge over Indus at Choglamsar. ü 8 nights camp with all camping facilities. 3 men spacious 4 season tents for 2, sleeping bags, foam mattresses, dining tent, trekking poles & safety gears. Day 1 Drive to Alchi – Lamayuru (3364m)- Wanla (3090m) - Hinju (3738m), 5-6 hrs. Day 2 Trek Hinju – Kongski La (4950m) – Sumda Chenmo Dok (4100m), 6-7 hrs. From camp you go along with the river. At the end of the river, you pass through the nomadic summer camp of village of Hinju and then steep ascent to the Kongski la. While enjoying the landscape of the surrounding wonderful mountains and valley, gently ascend to the pass. From the top, you enjoy awe inspiring view of landscape of the enchanting valley far flung view next day's passes to cross. Easy and gentle descent down in the valley and continue down as far as Sumdochenmo dok. Possible to see troupe of Yaks. Overnight camp near the small River. Day 3 Trek Sumda – Lanak (4300m) / Base, 5-6 hrs. Day 4 Trek Lanak – Dundunchan La (4800m) – Chilling (3180m), 6-7 hrs. Morning after breakfast, right from the camp gradually ascend up towards the Dundunchan pass. You pass across Shepherds, displaying their handmade skills and things and asking you to buy their products, of Chilling village while climbing the pass. From the pass, you everlasting lost landscape of surrounding valleys and snow clad peak of huge towering stunning mountains. Enjoy the unforgettable scenery of Awe inspiring view of massif peak of Kangyatse (6400m) and Stok Kangri (6153m).Easy steep descend, with imposing view of surrounding spectacular valleys and Zanskar River, as far as riverbed to cross the river 2 to 3 times up to Chilling. Late afternoon, explore village, its famous craftsmen and visit monastery and local house. Overnight camp at Chilling. Day 5 Drive to Choksti (3210m), 1 hr, Trek to Choksti dok (3210m), 5-6 hrs. Leave camp after breakfast for Choksti. We drive through stunning and exquisite gorges along left bank of downstream Zanskar. Cross motor bridge then turn right and take villager trail that leads to Choksti village. Continue easy ascend few minutes towards the beautiful small village Choksti (few houses). Explore the culture of village by visiting local house. 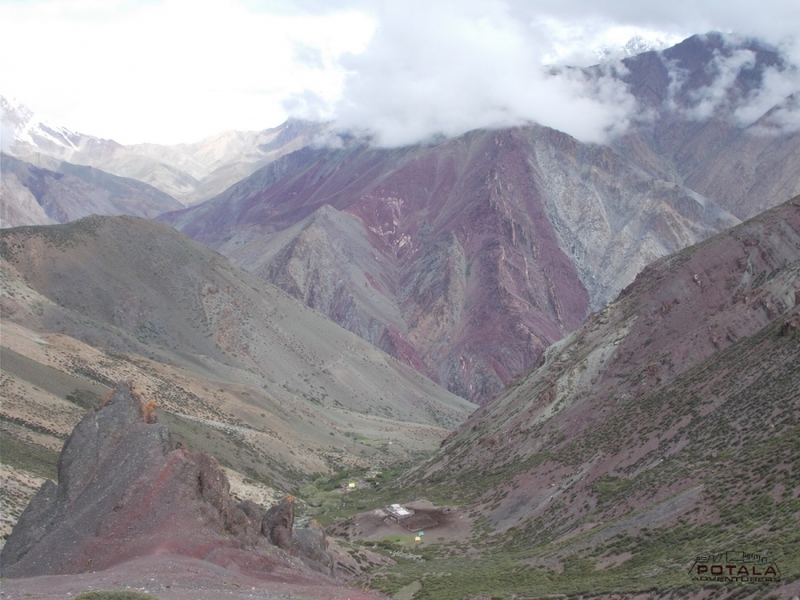 Enjoy the scenic beauty of the valley and surrounding huge spectacular mountains.From Choksti it goes slowly but consistently upward in the Stok Range Mountains. A fairly hard first days walking as we climb very steeply out of Choksi. As we ascend the valley narrows and becomes more and more spectacular. Looking back we can see the magnificent rock formations of the Ladakh Mountains. The dramatic mountains in various shades of purples, greens and browns can be seen for miles in every direction. The last trees and shrubs remain, barren, wild high mountain scenery surrounds you, and only along the watercourses thrives vibrant green. With a little luck you can watch the first mountain goats, marmots and Blue Sheep’s today. The tents are on a beautiful green square in the Choktsi dok. Anyone who wants can still take a trip to a lookout point with around 4480 m altitude after tea. Overnight camp at Choksti Dok. Day 6 Trek Choksti dok - base of Palam (5030m), 4-5 hrs. Climb to Skyang peak. Day 7 Trek base of Palam - Palam peak (5360m) –Ganda La (4800m) - Ganda La base (4400m), 6-7 hrs. 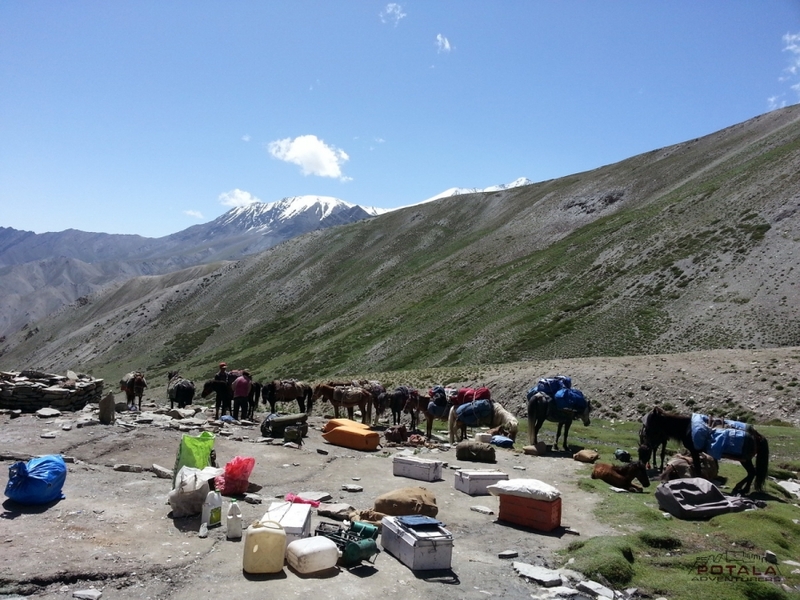 Day 9 Trek base - Stok La (4900m) to Stok, 7-8 hrs, Drive to Leh. 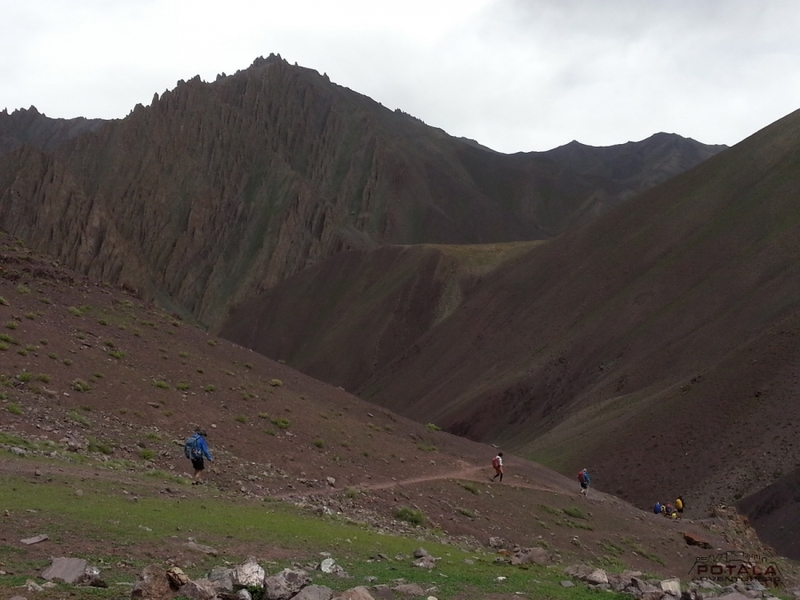 Leaving camp we cross the Stok La (4,900m), our last pass of the trek. At first we trek on a beautiful, gently sloping trail, but then the path becomes steeper and steeper as it zigzags up to the top of the pass. Rock flutes rise all around us, home to the elusive snow leopard. From the top the views are even more spectacular; layer upon layer of multicoloured rock cathedrals are spread before us in every direction. The descent is very steep at first and then we contour round two valleys to the junction with the river coming down from Stok Kangri. Follow the left bank of this river as far as the village Stok. Here you can visit the Stok Palace. 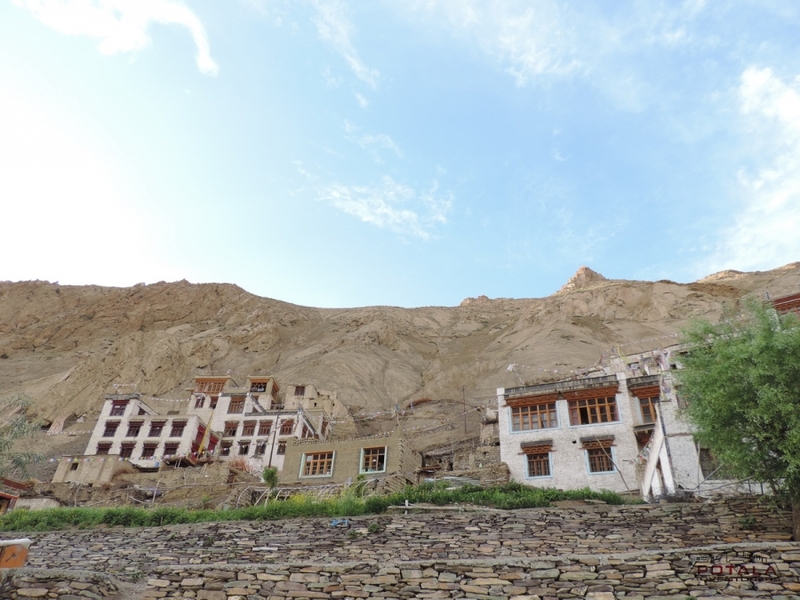 It was the home of the king of Ladakh. The museum has a unique display of rare ornaments from the royal family, plus tangkas, traditional clothing and jewellery. At Stok visit of Royal Palace built during 1825 AD and palace has great collections of antiquity. Continue to visit Matho situated 10 kms from Stok, which has 10th century complex. We drive to Leh which is situated opposite of Stok at a distance of 14 kms, crossing bridge over Indus at Choglamsar.